Do you have wrought iron doors Houston? If not, you should consider including them in your next home renovation. There are many benefits to installing these types of doors. Aside from being aesthetically pleasing, they are sturdy and durable. Adding a door of this type to your home can give it the dramatic facelift it may need. If you have been thinking about replacing your doors, wrought iron is an excellent choice. One huge benefit to using wrought iron interior doors in your home is how easy they are to maintain. These doors often take less time to clean than traditional wooden or steel doors. They are also resilient and will resist most types of damage. As long as you care for them well, wrought iron doors will last a long time. Following the tips below will help you keep your door looking newer, longer. Those searching for wrought iron exterior doors can visit Southern Front Stained Glass and Doors. Southern Front sells only the highest quality products, including beautifully constructed doors. They have a huge selection from which to choose. Interested consumers can view their products online at http://www.southernfront.com. Custom models are also available if you fail to find the perfect style for you. Contact Southern Front by calling 291-890-5860 to learn more. Take a look at the following tips to help you maintain your new Southern Front door. Cleaning your wrought iron interior doors is a lot easier than it seems. Wrought iron does not need the same type of deep clean that other types of doors need. Before you start, there are a few precautions you should take. First, be sure you wipe off the door with a nonabrasive cloth. This will remove any bits of dust or other small particles from the door’s surface. Be sure to avoid any abrasive cleaners or materials when taking on this chore. Wrought iron is durable, but will scratch or tarnish if you use harsh chemicals. The easiest way to keep your door clean is to use a homemade mix of warm water and mild soap. Dilute the soap or detergent as much as you can with the warm water, but leave a few suds. Always use a nonabrasive cloth to avoid scratching the surface. Microfiber is a popular choice, and is available. Use a separate, dry, cloth afterwards to dry off your door. You should speak with the supplier before using any chemical or cleanser on your door to be sure it is safe. Residents of the Houston area can call Southern Front Stained Glass and Doors at 281-890-5860 to learn more. Southern Front supplies high quality doors to people across the Houston area. You can browse their collection of wrought iron doors in store. You can also visit Southern Front online at http://www.SouthernFront.com. Friendly staff can answer your questions about purchasing and caring for wrought iron. Be sure to examine and maintain the hardware on these doors as well as the doors themselves. Many wrought iron doors, including wrought iron security doors, need special care. Without proper attention, they will not function for long. This is especially true of any locks, door hinges, and knobs, even if they are made with another material. As with interior doors, you should avoid abrasive cleansers and cloths when cleaning. Exterior doors tend to receive more collateral damage than interior ones. They are also more susceptible to scratches. Home and business owners need to care for each part of the door. This means lubricating the hinges and locking mechanisms on a regular basis. You should clean the locks once every few months to ensure your door continues to function. When planning your cleaning schedule, think about the physical location of the door. For example, doors near muddy areas will need more cleaning and maintenance. If there is a lot of salt water near you, you will need to watch for corrosion. Southern Front Stained Glass and Doors has a wide selection of exterior wrought iron doors. Their selection is suitable for homes and businesses. They have many years of experience serving the Houston area. As a result, they know the tips and tricks you need to keep your doors looking beautiful. Prospective customers can visit Southern Front online at http://www.southernfront.com. If you would prefer to speak with a staff member, you can call Southern Front at 281-890-5860. Many designers pair wrought iron and glass for a stunning look. Single iron doors may have one large window or several smaller ones. These doors bring a whole new aesthetic appeal to any area and are popular. They also need a different type of care than standard doors or solid wrought iron. The combination of makes it a bit trickier to clean. You still want to be sure you keep abrasive materials away from the iron. The tricky part is ensuring you get the glass completely clean at the same time. There are ways you can clean your glass without worrying about ruining the iron. Some homeowners use glass cleaners made with natural materials. Others make their own. To avoid spraying any on the iron, spray it into your cloth instead of on the glass. Speak with your door supplier first to be sure the glass does not need any specialized care. Wrought iron and glass doors are a beautiful addition to any home. You can view models in Houston by visiting Southern Front Stained Glass and Doors. They have a catalogue available online at http://www.southernfront.com. Prospective customers can contact them by phone at 281-890-5860. Sales representatives can show you available product and let you know the best way to care for your door. You may notice that wrought iron door prices vary from one company to another. Avoid buying the cheapest door without looking at other factors. Where possible, buy your doors from a reputable, local company. Try to find a company that offers custom door solutions as well as prefabricated ones. This flexibility will help you find the perfect door for your home or business. There is no need to compromise your taste when custom options are available. Customers across the country can contact Southern Front Stained Glass and Doors. 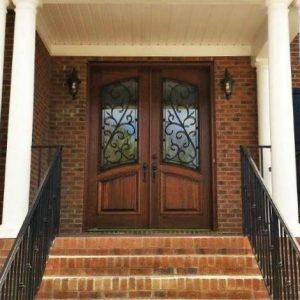 Southern Front supplies beautiful and high quality doors to homes and businesses. They have an extensive catalogue from which to choose. Or, you can request a custom order to suit your individual tastes. Southern Front is the proud member of three homebuilder’s associations. They will bring the same high service standard to you. You can visit Southern Front online at http://www.SouthernFront.com. You can also reach them by calling 281-890-5860. If you are searching for the best wrought iron doors Houston, look no further than Southern Front.